Danger, Will Robinson! Cranky Post Alert! What to be? What to be? Liam's costume was a snap. The Superman costume in the previous post has become ordinary clothing--he all but wears it to bed. I knew this would happen when I showed it to him upon bringing it home. And that's OK. He gets so much joy out of being a superhero that I decided to get him another costume, this one complete with pecs and abs, for actual Halloween. With his blonde hair he makes a fabulous Mr. Incredible, even if he looks more like Dash. Here, he pauses to have a word with Thomas the Tank Engine, his other passion. I love how this little boy will stop and chat with anyone. He's so much like his Grampa Zickefoose. Sometimes he ducks his head and looks up at me in a certain way and I'm sure I'm seeing my dad at 6. 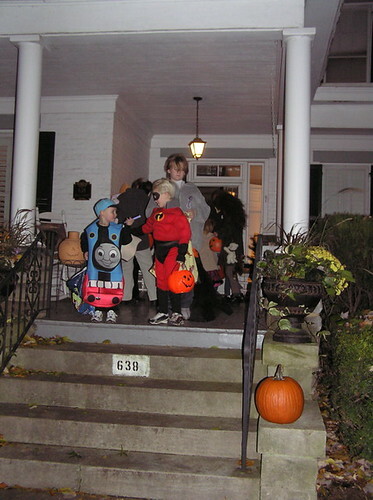 Liam is teetering, at almost 7, on the edge of being too old for Thomas (but not quite realizing that yet). He's tiptoeing into superhero territory. Mr. Incredible conquers Pokey the Springer. Photo coach in background. He was a frog. That's why he's all green. If he didn't have to take his costume off to pee, he'd wear it around the clock. I think it's good for a first-grader to feel invulnerable. Liam looks so tuff here. Phoebe came up with both her and my costume ideas this year. The older and wiser that girl gets, the more I come to lean on her for ideas. 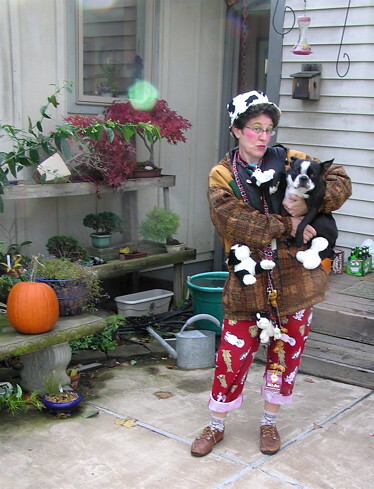 Out of the clear blue, she decided she'd be a Crazy Cat Lady. 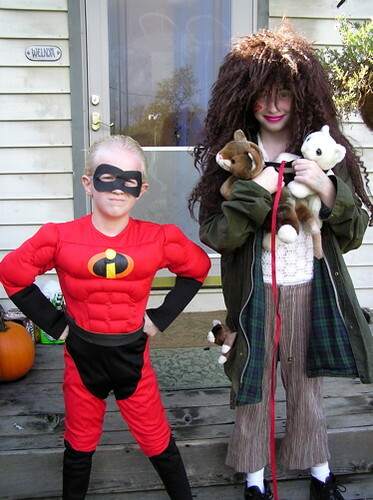 She concocted a costume consisting of my stinky old oilcloth Barbour jacket, some too-short pants, clunky boots, bad socks, baggy sweaters, and a wig we'd purchased so Bill could be Shaggy a couple of years ago. A little bad makeup on top of it, a cluster of stuffed cats, and she appeared at the Artists' Gathering, a phoenix full-blown from nothing. 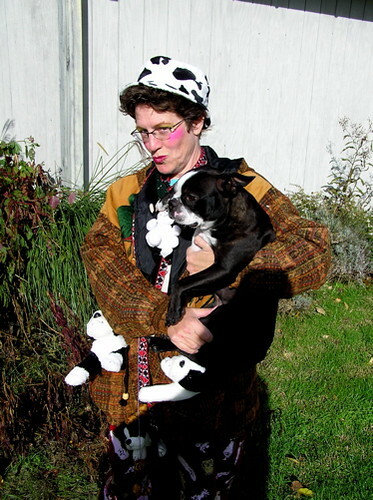 So, when trick-or-treat day rolled around, Phoebs suggested that I should be a Crazy Dog Lady. Or, more correctly, I should dress more obviously. Over the past two years, I have undergone the transformation from a non-dog person to a Crazy Dog Lady. This is just my coming-out outfit. I bought these pants just to drive Bill nuts. But they came in handy come Halloween. 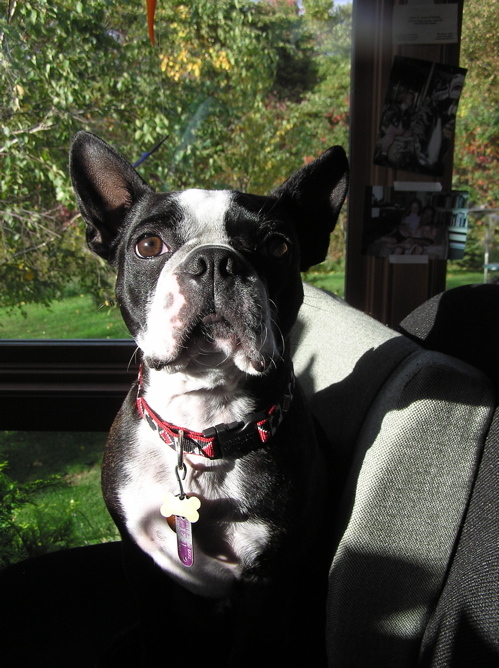 I made a sign with a puppy photo of Chet on it, and little tear-off tabs for the Boston terriers I was "selling." (see them in my pockets?) The sign said, " Boston Terrier Puppies for Sale. Parents, grandparents and great-grandparents on premises." If Chet looks afraid, well, he is. He looks like a puppy who has just been bought by the person he was afraid might buy him. He looks like he thinks he's doomed to a lifetime of wearing hats and jackets, of being called Ookum Schnookums, and of having little boots strapped onto his feet when it's raining. Although I do buy him tasteful designer doggie polo shirts whenever I get within an hour of a Target, and I do moosh tasty beefy morsels into his Royal Canin kibble, and he has been known to sleep with his head on a down pillow, and he labors under a topheavy load of ridiculous nicknames, I can assure you that overall, he's content with his lot as the darling of the Crazy Dog Lady of Whipple. He was just embarrassed for me, that's all. Ecch, I'm embarrassed for me. One of the great luxuries of hosting the Artists' Gathering was being able to include our kids in the fun. Living as far out in the sticks as we do, Phoebe and Liam LOVE having company. But company that will play with them and bring cool things to look at is even better. This post is going to be an unabashed rhapsody on the coolness of one Larry Barth of Stahlstown, PA, the world's greatest bird carver. If that sounds jejeune of me, consider: I've judged several bird carving competitions, and I'm well aware that the field of bird carving is given to breathless hyperbole. The Ward Foundation World Championship is held each spring in Ocean City, Maryland, and it is huge. Carvers from all over the world compete. There are big blowsy blue ribbons and lots of puffery. But Larry Barth is the undisputed Mr. Universe of Bird Carving in my eyes, and pretty much everyone else's, too. That's because he knows birds from the inside out, and he has the soul of an artist coupled with the mind of a physicist. I paint birds on paper. So does Larry. Here are some life sketches he made of a least bittern. He draws like a demon. But then, having drawn them from every conceivable angle (and from life, I must add), Larry carves those birds from wood, needing in the process to know every single feather and shape; how they look upside down, from the rear, head on, from above and from underneath. He's got to get all those planes and shapes just right. He's got to carve every feather and burn every barbule in with a woodburner. THEN he has to figure out how to construct, from copper, brass, metal, epoxy, and what-have-you, the plants they perch on. He's got to figure out what kind of base will support all this, and make all the supports invisible. THEN, and only then, does he get to paint these birds with acrylic paints, making sure they have the sheen of healthy feathers without looking like plastic. And he does all this, and makes it look absolutely effortless, and heartbreakingly beautiful. Here's his 2006 World Championship winner, 'I'iwi and Ohio Lehua. For this piece, he traveled to Hawaii and sought out the endemi 'i'iwi in its native vegetation. In the end, Liam, who is either going to be Superman (note pumpin' abs) or Mr. 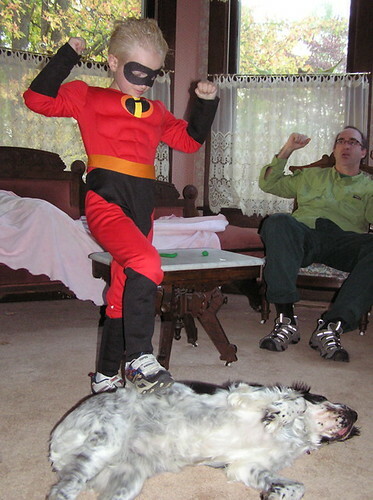 Incredible for Halloween, triumphed. He got Mr. Universe down on the kitchen floor, planted a boot on his chest, and subjected him to a thorough lickin' from Chet Baker. Baker is sensitive to people in need, and sympathizes with the underdog in any altercation. I probably don't need to mention that Larry Barth, in addition to all the virtues I've listed, is also a mighty kind and fine human being. Kids and dogs are never wrong. Just a public service announcement to let you know that Birdchick's blog is temporarily incapacitated, as you may have noticed (I certainly have missed it!). The server that hosts her site got corrupted on Saturday, and they're working on the problem, but not fast enough for Sharon and her loyal fans. Birdchick's alive and well and running around Cape May NJ's Fall Weekend, and she's painfully embarrassed to find her site down. Hang in there; she'll be back better than ever, with much pent-up blogging instinct to vent. I never tire of watching Chet make his way down the trail in front of me, seeing how the sun hits off his shiny back, how his hind legs work in graceful complimentary curves as he makes his way catlike through the leaves. I could not stay inside this morning. After a frighteningly blustery and cold trick-or-treating adventure, the sky was scrubbed fresh and what leaves remain are vivid against an immaculate sky. Chet and I lit out around the Loop. I took pictures every few feet. At the overlook, I leashed Chet, and he studied a little black heifer without tightening the lead. I keep asking myself what he'd do if he weren't leashed, but I can't allow myself to experiment with this precious little animal. He walks obediently ahead of me, slack in the leash, and sits down to watch the cattle. Is this the same ravening beast that tore after the cattle only a few weeks ago? Yes, but this one is connected to me by a nylon strap. And this physical reminder to behave is the only way that training will override instinct, I fear. Maybe when we're both old and gray, I'll be able to trust him. Farther along the trail, Chet led me into a part of our woods I hadn't walked for years. It's the best "timber" we have, with 3 and 4' dbh oaks and hickories in a clear understory. Lovely. And not scheduled to be cut, like the big oaks and hickories just over the fenceline are. There was a deadfall with associated branches and a thick grove of young pawpaws that had come up in the light gap. Pawpaws are easy to spot in late October, because they hang onto their huge golden teardrop-shaped leaves long after most of the others have fallen. And in the middle of that deadfall was a tremendous buck and three does. I was so glad I'd leashed Chet, because I got to watch that animal thunder out of there, rocking like a wooden horse, his antlers a high crown. I know there were at least five points on each side, not counting the brow tines--a thicket of points. My best guess is that he had 12 to 14. I was so glad to see him. Perhaps he's the son or grandson of our fallen monarch, whose picture I snapped about five years ago in a snowstorm. The picture looks a little over-sharpened, because I want you to see the high crown of tines on his antlers. When he'd stride out into the orchard he looked like a pony, gotten loose. This kingly animal lived here in peace, until one Thanksgiving morning when a bow-toting poacher figured we'd be busy with the turkey, and killed him practically in our back yard. We went out that afternoon and found where he'd been shot on our land, then dragged across the property line to be field dressed and gutted. I've never gotten over that murder, for murder it was. A buck that grand doesn't go unnoticed for long, and people who assign value to an animal based on the size of its antlers will stop at nothing to possess it--end its life for their own bizarre acquisitive gain. Now he's a dried-out head on a wall somewhere, or maybe a couple of antlers on a plaque, spider webs collecting on them. I liked him better alive, in our woods, where he belonged. He should have been safe here. There's irony here, because as noted I was cooking a turkey while this other premeditated murder was going on, and yes, I'm thinking about that for a moment. Wishing this buck better luck, knowing that the yellow NO HUNTING sign Bill posted right over the deadfall where the buck was laid up is no guarantee of sanctuary. It's a request for compliance, nothing more, and useless against greed and avarice. And now I'm retying my bootlace and going on up the hill through the golden and blue shimmering orchard, toward home. There would be more photos, but Blogger is giving me fits, as usual. I've been trying to post this since noon with only partial success.Pah! what a waste of time on one of the last golden days of October. The same smell hurricanes leave. Had I remembered to bring them in. To look at me, looking at you. It might be argued that, as much fun as we all had at the Gathering, Chet Baker had the most fun. That dog went from lap to lap, soaking up attention like the sponge he is. He pogo'ed up to kiss people on the lips for the first hour or so, then settled on doggy lap-dancing for the rest of the visit. We decided that Baker is a cat in dog's clothing. When Baker's really happy, surrounded by a human pack, he gets a new Nylabone and chews it noisily in the center of the circle. He makes an incredibly loud grinding noise that all but drowns out the conversation. I buy Nylabones practically every time I go to the store, and I had better have one somewhere in the plastic shopping bags when I come home, or Baker becomes despondent. Baker was gnawing. Krrrunk krrrunk krrrunk krrunkety krrrunk. Larry Barth, who, as a sculptor, appreciates the value of a good vise, offered to hold Baker's Nylabone in the crook of his knee. Baker thought that was a grand idea. But soon, he wrenched the bone away and trotted over to plein aire oil painter Jim Coe, and lodged the bone in Jim's leg to chew. Before I go on, I must give you a little taste of what this remarkable man can do. Look at those landscapes!! Those exquisite birds! This man paints those landscapes OUTDOORS. Plein aire. He's out there with an easel, working with oil paints in all kinds of cold and weather, and there's no other way to get a painting like that. For more of Jim Coe's work, go to his web site. Back to Baker's pestiferousness: Do you think Chet Baker cares that the man he's pestering to death is one of the finest plein aire painters in the world? I'm not exactly sure that having a Nylabone jammed in the crook of his knee would have been Jim's first choice for the evening's entertainment. But like a cat, Baker knew where he was not invited, and pressed his advantage. Jim took the bone and tossed it back to Larry, who lodged it enticingly in his bent leg. Baker extracted it and raced back to chew it on poor Jim, who was trying to appreciate the music. Krrunk krrunk krrunk krrunk! This went on for at least ten relays, with everyone getting more and more tickled about it each time. Larry tried tempting Baker with other toys, but it was of no use. Chet Baker preferred to grind away on poor Jim, and nothing would dissuade him. As everyone left Sunday afternoon, I assured Jim that within a year, he'd miss Chet Baker so much that he'd doubtless have his very own Boston terrier. Don't hold your breath, Baker! Rest assured you are thoroughly loved, little doggie. From left: Mike DiGiorgio, Jim Coe, Debby Kaspari, Cindy House, Zick, Phoebe, Shila Wilson, Brenda Carter, Linda Barth, Larry Barth. In front: Liam, Chet Baker and Barry Van Dusen. Photo by Kitchen Boy Bill. Yes, it was some weekend. One of the best of my life. I got all my best painter/artist friends (missing only a couple) to come out here for their yearly Artists' Gathering. This get-together is held at our homes, and we pass it around. Since most of them live in and around New England, most of the Gatherings happen there. But this one would be special, and I guess the Weather Gods agreed. It has been indescribably nasty and cold here of late--day after day of rain and wind. There has been one break in the weather, and that day was Saturday, the day everyone was here to see why we love southeast Ohio so very much. You'd swear Indigo Hill knew a bunch of landscape and bird painters were descending on her. She put on her prettiest fall dress and smiled all day long. Everyone got a load of the steep relief here, no big deal to New Englanders, but a workout nonetheless. I got to show them my beloved Chute, with fresh rain sliding over the sandstone stairs. Birds were popping out of the trees: a very late blue-headed vireo, a merlin, gobs of bluebirds and yellow-rumped warblers; even a male Cape May warbler. These people don't miss much. I can't tell you what it meant to me to have my best and oldest friends stay here and drink in our home, our birding tower and our beloved woods. To eat at our table (fed to repletion by Chef BOTB), even sleep on our beds, couches and floors. To see our kids interact with them (more on that later). I was verklempt the entire weekend. Usually, I go to these gatherings and hunt like a ferret for information, contacts, new colors to try, new techniques. I bring lots of stuff to show (we do show-and-tell of what we've been working on in the past year) and I stare hard at what everyone else does. This one was different. I don't know what has changed in me, but this time I spent all my time just appreciating these people who mean so much to me. Yes, I stared at their artwork, which gets more magnificent with each passing year, and got some tips and loads of inspiration. 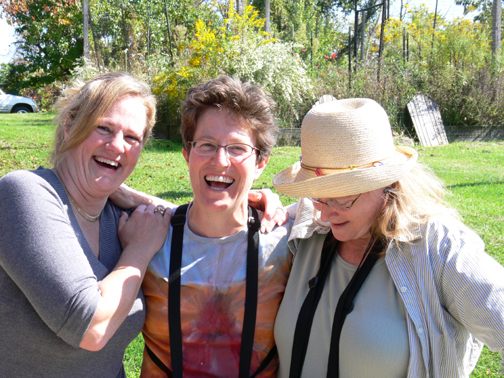 But mostly, I thought about how lucky I am to have such dear friends. Here's Bill, taking a break from kitchen patrol. He worked so hard all weekend to make sure no one wanted for anything--including breakfast, lunch, dinner, coffee, and digital projection capability--and to make sure I stayed out of the cookpots and just had a blast. Like anything he puts his mind to, he was hugely successful at that. Debby Kaspari looks like his little ventriloquist's doll, sitting on his shoulder, doesn't she? Hello, Bill! I'm having a wonnerful time here! Because there was so much to look at and so many things to stop for, the hike around The Loop got a little lengthy for Phoebe and Liam. They decided to turn back and walk home by themselves--a first. Watching their little forms disappear back down Gallagher's Fork, knowing they knew their way home perfectly, and finally, at 10 and almost 7, were brave enough to act on that, filled my already overfull heart. Phoebe said, "I was a little scared. We heard a gunshot and quickened our pace from then on." It's done, I think. Although I toned down the highlights on the bird's breast after this picture was taken. Truth is, it'll probably never be done; I'll just have to quit at some point. In response to Carolyn's question, I double-checked on those images of firefighting planes, and I can't quite see how they take on water. There's no visible bucket on the undercarriage. I think it involves doors that open up as they skim over the water. This one has just gotten a load, closed its doors, and is dribbling a bit. There is no grebe in the water tank. Our hero is celebrating that fact. Back to the story to be illustrated. There's this baby western grebe, see? And the first thing that happens to it is an otter tries to eat it. Cool. I like otters. So I painted that scene. Pretty straightforward. No masking or lurid colors. I tried to make the otter look more disappointed than menacing, but I made the daddy bird look pretty pissed off. He's wearing his Napoleon Bonaparte-style hat of fury. If his bill appears bent it's something that happened in the translation from Flickr to Blogger. Blogger is still not working for me. Booooring. I think a lot as I paint this stuff. 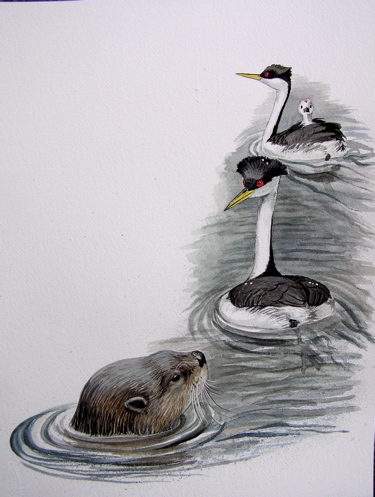 It seems to me that if an otter even wanted to eat a western grebe, it could annihilate one in a couple of seconds. Those mustelids don't fool around. Down, Zick. You're just the illustrator here. Always a problem. I can't shut myself up. 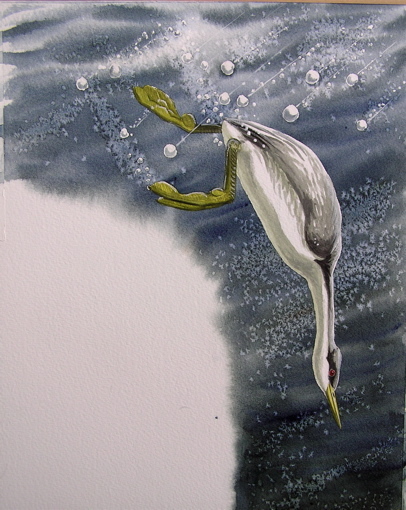 The second painting was to be of the baby western grebe, grown up now, caught in a hailstorm! Zoiks! I like painting underwater scenes. This one was pure fun. Lots of masking film and liquid masking compound involved. Salt, too, for the underwater sparkles, sprinkled into the wet blue wash. 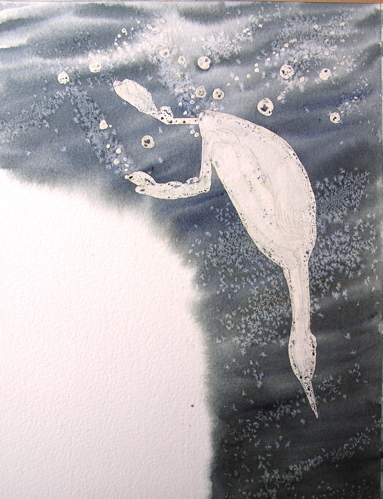 Here's the grebe and the hailstones, masked out with film and liquid masking compound. I've painted the dark wash right over them, and sprinkled salt into it to make sparkles and bubbles. I found a very cool film taken in Monterey, of a WEGR rowing by the camera in an underwater canyon, its feet pumping like crazy fans out to each side. I suspect it was made at the Monterey Aquarium. Wherever it was made, it was priceless to me. Oh, I love my job. Here , I've peeled off the masking film and painted its feet and the hailstones. Bill, who looks at my stuff as it develops, commented that the hailstones needed some little lines following them into the water, because they were reading as big bubbles. Yep. Little lines go in, and suddenly there's peril! Ow! Ow! Ow! I'm happy with this one. It seems to have captured the silvery quality of a bird swimming underwater. Wouldn't you know, it was the quickest and most fun to paint, too. 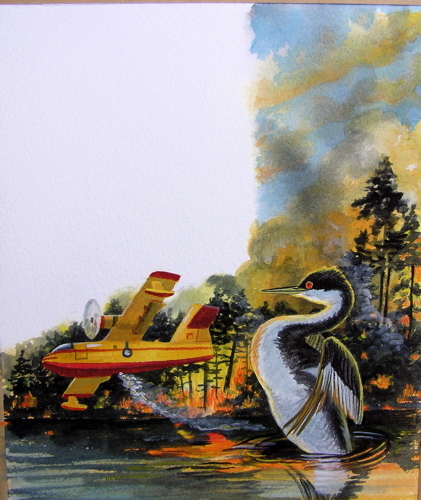 Here ends Grebe Apocalypse Painting (Intermediate Level). This post is late today because I am fried crispy from a weekend that was way too much fun. Imagine a dozen people all packed into our house, talking art, playing music, and eating our heads off for two days. Pictures and posts to follow. I'm still processing all that went down, and it was all real good. Sitting over coffee and tea Sunday morning, we got to talking about the sometimes outrageous demands of illustration, and I brought these paintings out (not without some trepidation) to gales of laughter from my friends, most of whom have the sense to paint bucolic landscapes and birds in non-apocalyptic settings. Impending disaster is right where 7-year-old boys like to be. Liam draws these tableaux of airplanes flying into the sides of houses, while somebody in a hot-air balloon drops bombs; trains plunging off high trestles into shark-infested waters. In this one, note the closed eyes of the supplicants as they hail the king. I like the king's mustache. I really like doing kids' magazine illustration. It's different from a lot of illustration jobs, in that there's much more storytelling in the pictures. Another trend is that there seems to be a lot of disaster. I'd never slam Steve Irwin, but he did usher in a trend in kids' nature TV that tends toward high peril and drama (usually manufactured). Well, he wasn't the first; he was about two decades after Mutual of Omaha's Wild Kingdom, where the point was always to dart and immobilize the animal. It was my favorite, mostly because it was the only animal show on TV. As if what the animals do in everyday life weren't interesting enough. I never watch Animal Planet anymore, but when Phoebe was small, I logged quite a few hours glancing at the screen to see what she was taking in. That's how I came to love John Acorn's program, "The Nature Nut." I loved everything about it: the way he wrote and performed silly songs about the creatures he featured; the way he imparted such a solid idea of their natural history without ever resorting to pedantry or impending disaster; the way he empathized with animals. A pivotal episode was about a fathead minnow named Joe Snumm, who lived under a dock. There was a song to go with it, too. Go John. Probably the only fathead minnow ever to make it to network TV. Much, much too gentle and wise for today's television. Now what we get are endless shows about animals that just might poison you or bite your leg off, and jittery khaki-clad hosts who court disaster. Standing back and watching quietly is so passe. One of the last things I watched on AP was "Jane Goodall: Return to Gombe." I soak up anything I can about Jane. And sure enough, AP manufactured a thread story that involved a chimp that was old, and maybe sick, and missing. The chimp was off somewhere doing something else when Jane came back to her old research station. And every commercial break panted, "Will Jane find Fifi?" Please. Just let the camera run. Show us Jane, show us a troop of chimps doing what chimps do. That's way more than enough. I got off on manufactured drama in television. Sorry. I guess it's because I've been grunting, cussing and sweating over a kids' magazine illustration for the past few days. I'll tell you about the other two paintings in another post. They were fun to do, no big deal. But the third painting. There's this big forest fire, see? And the grebe is minding its own bidness out on the lake, and suddenly out of the sky comes a huge smoke bomber airplane, coming down to take on water to dump on the fire. Eeep! And the poor grebe almost gets slurped up in the intake, oh no! So somehow all these elements need to be incorporated on about half of an 8 x 11" page. All the while accommodating the text, which accounts for the strange L-shape of all three illustrations. Oh, my. I'd never painted a forest fire before. Google image search to the rescue. There were some killer forest fire images on the Web. Found a smoke bomber, too. Here's the initial drawing, all wet down. 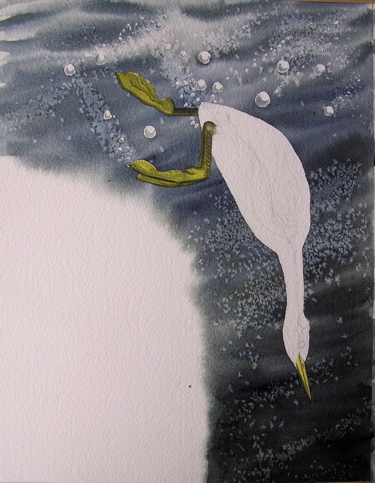 The plane and bird are masked with film and masking compound to keep the background washes from coloring where they will go. First, the fire orange. In watercolor, you paint lights first, darks later,over top of the lights. Lots of orange and yellow. I started shooting progress photos of the painting, but pretty soon the painting was sitting on me and threatening to smash me, and I quit. I had to save all my limited mental power just to grapple with it. At this stage, it's starting to get really hairy. Ugh. My sky is too livid. I've got to bring some smoke across it. So I wet the sky down with a spray bottle and touch a brush loaded with ivory black to the wet wash. There, that kind of looks like smoke, I think. This is the point at which I'm unable to shoot more progress photos. I'm about to lose control of the painting. Dang, there are so many things going on here! The main thing I fight is that it keeps reading as a really pretty sunset, not an awful forest fire. So I paint in the actual flames, and put in a lot more smoke, and it starts to work. Then, the smoke bomber goes in. I'm not really done with it at this point, but I have wrestled it to the ground. Don't get me wrong: I love doing stuff like this. But it isn't easy. It's a real challenge. I'm not faulting the magazine, the writer or the editors. They know what kids like to read, and I need the work. But this painting was a real bear to execute, and I'm glad to be on the other side of it. Definitely earned my pay on this one! That right there is about as much impending disaster as you'd want to pack into a 3 x 8 x 8" bird painting. It was a day. I awoke at 3 AM, never to fall back asleep again. I think the medical term is "sleep maintenance insomnia." I can fall asleep every night at 11:23, letting a book slump to my chest, but 3 AM comes around and my body, for reasons all its own, decides it's morning. It's a drag, and I know it's the artifact of an overactive mind, darting about between stressors. I think about one for awhile, and then go over to another, more upsetting one, and then to a third, and a fourth. And I run around those miserable bases for the next three hours, until Liam comes clumping into the bathroom on the other side of the wall at 6:07 sharp. And my day begins, whether I'm ready for it or not. Today was cloudy and mild, and another ten bazillion ladybugs decided our house was where they wanted to spend the winter. Every time I went outside, I came back in with at least six on me. I've taken to swatting them like mosquitoes, smacking them as hard as I can as they bite my neck and arms. I know there's an insect rights advocate out there just waiting to spank me, but that's what I do. I will invite any IRA to spend the winter here, and guarantee that he'll be smacking them by Christmas without giving it a second thought. Being of no real use to humanity today, I decided to keep my hands off two in-progress bird paintings, and instead to put away four washing cycles' worth of clean laundry that had stacked up in baskets while I painted and drew. I was just sharp enough to decide whose socks were whose, and no more. Of course, by now there were two more baskets full of dirty clothes to do. And so, because I was in the midst of calling my two Witches for support, I took the cordless phone handset downstairs in the laundry basket. I threw the darks in the machine and came back upstairs. Looked for the phone: not in its cradle. Pushed the PAGE button. No friendly beep in response. Trudged back down the stairs, plunged my arm up to the shoulder in the washing machine, and came up with the cordless handset in one try. Like the Titanic, its lights were still burning down there under the sea. Mind you, I had already drowned the other handset late this summer, when I was outside talking on the phone in the rain. That was OK, but then I heard a little plupping sound from my rainbucket, and found a juvenile common yellowthroat about to drown. I put the handset down, saved the bird, photographed it, released it and went inside smiling, leaving that phone out on a plant bench in the rain overnight. It was lit up, too, when I found it the next morning. It lay in state for a week, all lit up, and then began to decompose. Now we have no cordless phones at all. Which is a problem for a family of hard-bitten multitaskers. Anyone who talks to me for long hears: running water rattling birdcage papers dishes being put away laundry being hung out beds being made feeders being filled aquariums being siphoned vegetables being chopped ladybugs being swept up things being sauteed and the like. Being on the tetherphone drives me nuts. I called Bill to confess my serial murder and he ordered another one just like it but with three handsets. I said, "Good, that'll give me two to drown and one to use for awhile, until I drown that one, too." The best thing I did today was collapse at about 2 pm, my nose buried in Chet's shiny fur. It wasn't much of a nap, because he had two dreams about chasing bennehs, cats, or cows, hard to tell which. Muffled barking, clomping of jaws, much paddling of paws and rapid eye movement. Still, lying there with Chet in my arms seemed to keep me at home plate. Look closely for cutelips. I wish to thank all those who suggested the alternate posting option of Flickr.com, and especially William Stiteler for teaching me a way to post photos again. Blogger, go sit in the rain until you light up. Just a quick post to let you know that if you'd like to see me in person, I've FINALLY posted a list of appearances on my web site. I don't know if you could properly call it a book tour, but it's a list of peregrinations. It will grow from here on out, but it's a start. One request: As you approach, quickly blurt the word, "BLOG." Then I'll know that you know waaaay too much about me, and we'll proceed with due caution. Here's the link. Every October, along about Halloween, they come. Billions upon billions of them, swarming over our house, working their teensy way into every crevice, clustering around the windows, pooping on the glass in tiny sticky orange spots. From there, they find their way into light fixtures, where they die by the hundred. They also appear in our food, our hair, our mouths, in the glasses of water at our bedside (gulp in darkness, foul, acrid taste, ptooo! curse!) When they get on our necks or arms, they bite, a hot needle. They are everywhere. We rarely see them before Halloween. But we just got an early taste of what this winter's going to be like. A warm October afternoon, just the kind of day you want to be in and out of the door. And there were so many Asian Multi-colored Ladybird Beetles (we prefer the tag, "f-in bugs!") that opening the door for even a few seconds welcomed several hundred inside. All over the country, the same thing happens. 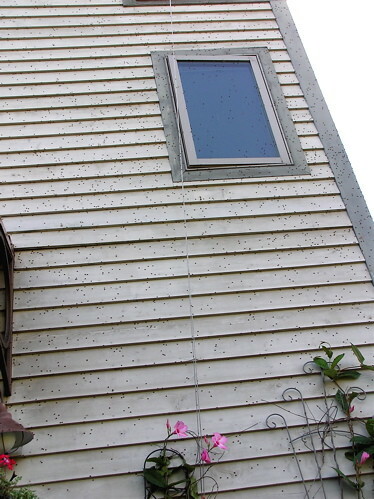 The beetles are particularly attracted to tall, light-colored structures on ridgetops. Duh, that's our house to a T. From late October until May, we live with these things crawling on every surface in our house, stinking up the vacuum cleaner bag. Every evening, I sweep the kitchen floor, netting a dustpan absolutely full of dead bugs. Their frass collects like brown dust on all the windowsills. They stink to high heaven, they bite, and they are absolutely disgusting. And there is nothing we can do about it. I know several women, who I will not name, who I know for a fact would not survive having their homes so infested. They would simply up and die of horror. 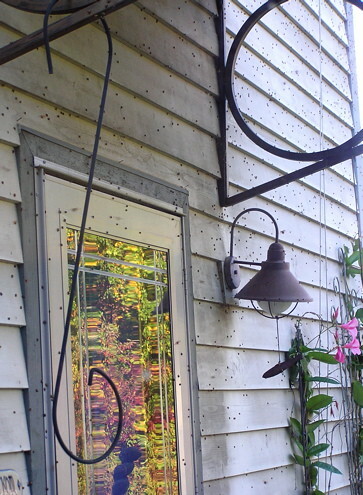 I pray that these people will never have to host 10 bazillion ladybugs each winter, as we do. They would go barking mad. But I am thankful, deeply thankful, and I'm sure millions of other homeowners, host to billions upon billions of ladybugs, are thankful too. Because these highly beneficial insects, we are told, eat alfalfa aphids. That's why they were imported from Asia. There are so many good things that have been imported from Asia. Hmmm. Multiflora rose, walking catfish, Japanese honeysuckle, Ailanthus trees, and kudzu, to name just a few standouts. And if there's anything that's worth putting up with this infestation, year in and year out, it's a reduction in the number of alfalfa aphids in this poor old world. And so we sleep well at night, drinking ladybugs in our bedside glasses, brushing ladybugs off our pajama sleeves and digging them out of the folds of our necks, knowing that the alfalfa aphid is finally under biological control.